I’m not your classic party girl… but if I were, I’d be panicking right about now. You see, December is the most traditional of party seasons, that time of year when you’re really not supposed to wear the same dress twice. And as thankful as I am for a red carpet-void lifestyle, I’m even more thankful for the fact that I don’t have to embark on strict beauty rituals to maintain an appearance fit for public consumption. 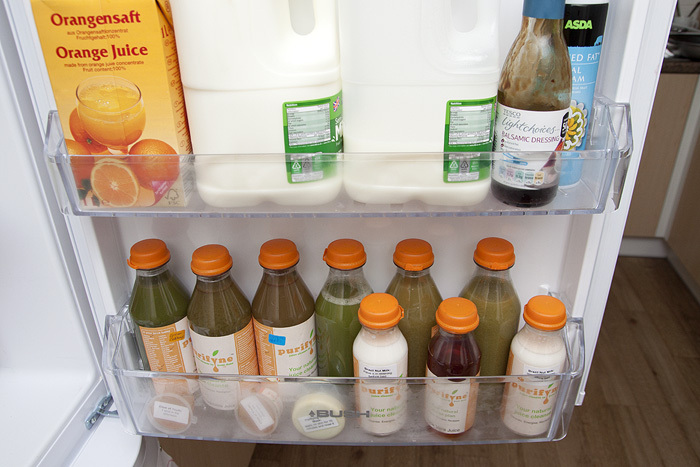 So why the hell did I agree to trial a Beauty Juice Cleanse for 5 days? Well, because I had massive bloat, felt like a spotty teenager, and wanted a kick up the backside toward behaving more healthily again. Almost everything is provided on the plan, the juices (and supplements) arrived by early-morning post and were still cold on arrival thanks to a well-insulated cool bag and a nip in the air. I eyed them suspiciously, I’m of the firm opinion that rarely does anything green actually taste pleasant. I was proven both right (and wrong), as you’ll soon discover. The morning ritual consisted of starting the day with a barrage of powders, capsules and warm water that tasted suspiciously of sub-standard supermarket lemons (my fault) before consuming the first of the day’s three Purifyne juices. The Colosan powder ensures that you purge the waste efficiently whilst taking on the benefits of the juices. 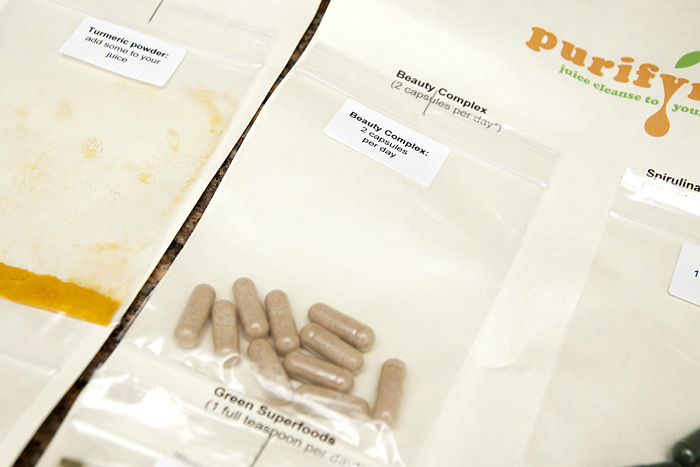 Unless you know your tolerance for herbal laxatives, start small and build your way up. And don’t stray too far from a toilet at first. Trust. I continued to sip at my juices throughout the day, alternating them with filtered water – by the end of day one, I would have robbed your granny for a Pepsi Max. I can honestly say that I didn’t feel hunger throughout the 5 days of the plan. Not once. But don’t confuse that for one-second with “not wanting to eat anything” because as your granny was getting back on her feet, I’d have knocked her back down again for the Greggs sausage roll in her handbag. Infact, on day 2 and day 4, I had to put myself to bed early because I was quite the grumpiest of baggages without a square meal inside of me. 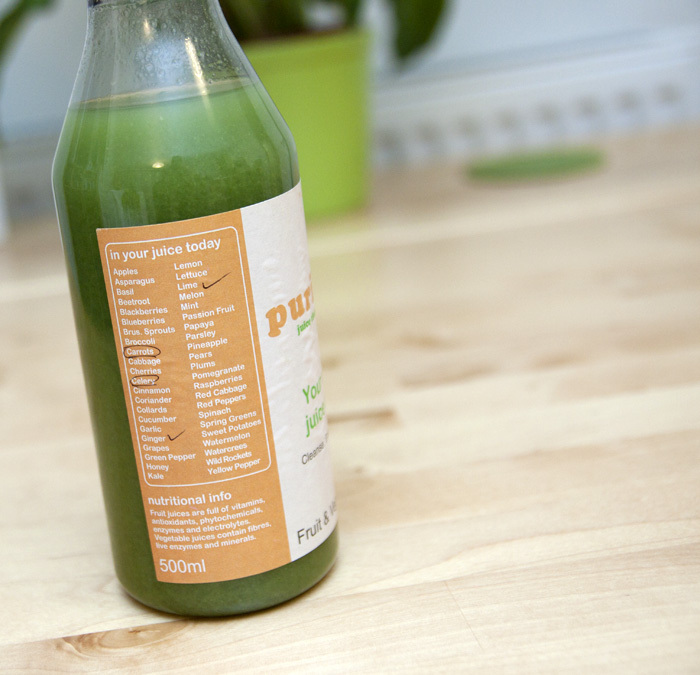 Having said that, with the exception of one… the juices were good. Hilariously, out of all of them, it was only the very greenest of juices that I couldn’t stomach (there’s a picture of it toward the bottom of the post). I ended up pouring it down the sink, I just couldn’t deal. I must have gone into ketosis at some point between day 3 and day 4 because I felt a little shaky and light-headed on the morning of day 3 and recognised those symptoms from the Cambridge Diet – however, this isn’t a “diet”… not at all, and I definitely suffered less carb withdrawals (headaches etc.) on this plan. Afternoons involved taking a beauty “shot”, of a substance quite hopefully named “elixir of youth”, and do you know – it was delicious! Unfortunately, I had to follow that up with a shot of Aloe Vera juice, which… I could only get down my throat by holding my nose and praying for instant sinusitis. 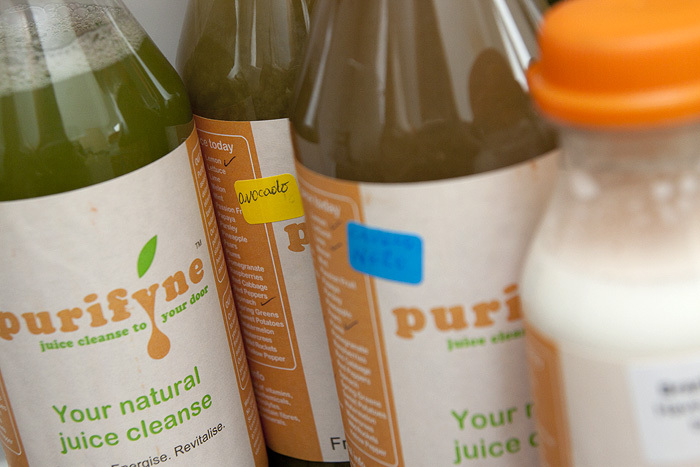 One of the most enjoyable aspects of the Purifyne Beautifyne Juice Cleanse is the wonderful excuse for a bit of pampering. Every evening, I bathed in Dead Sea salts whilst sporting a hideously unnattractive mud mask. Creature from the Black Lagoon much? You could have thrown in a bit of seaweed and I’d have been dodging harpoons left, right and centre. I felt so completely relaxed (and slightly wobbly) after pulling the plug each night that I was more than happy to head to bed with my final drink of the evening, Brazil Nut Milk. Not quite a hot chocolate… but refreshing nonetheless. Day 4, the penultimate day…. was a strange one. I felt SO ready to eat normal food, but I was also just starting to feel the benefits of four days of juice injection. Mr L told me that my eyes looked sparkly. I wasn’t sure if he’d caught me remembering what a KFC tasted like or whether I was actually reaping the benefits of all those vitamins, either way – he was kind enough to notice that I was looking more perky than usual. Of course, I weighed myself every morning… I wasn’t going to, but I couldn’t resist. I lost a total of 8lbs over the course of the five days. I also put 4lbs back on within 72hrs, but then I didn’t follow the “aftercare” plan and I was well aware that a lot of what I’d lost would have been water, which pops straight back on when you start eating refined carbs, sugars, salt etc. But anyway, I didn’t do it to lose weight… hell, this juice cleanse isn’t even about that. The Beautifyne Juice Cleanse offers the opportunity to “enhance your beauty” through chlorophyll-packed Green Juices and carefully selected supplements. Well, I’ll let you be the judge of that. The plan is cleverly-devised, simple to follow and well-supported. Any queries I had over email were answered within the hour and I was also provided with a daily email alert reminding me how to stay on track and get the most from the experience. My only complaint is that I would have liked to have been provided with an “in preparation” shopping list so I could have been ready with things like fresh, organic lemons/epsom salt/additional drinks. Ultimately, would I do it again? Well, if I had the money and was told that I’d be wedged between Watts and Mendes for a couple of pap shots, I’d be chugging back the “elixir of youth” shots in a heartbeat. 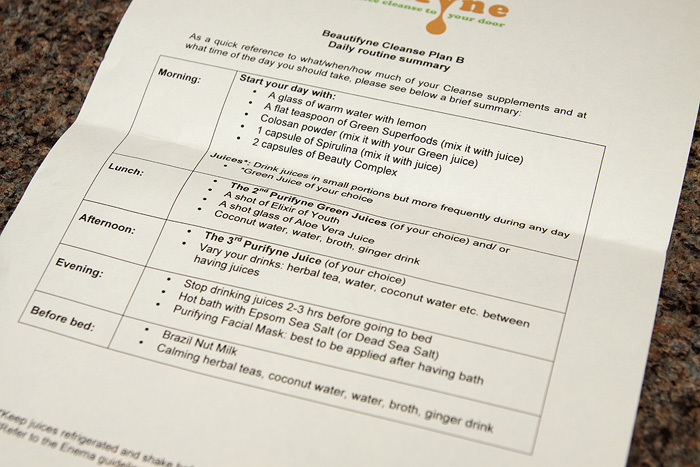 The 5-day Purifyne Beautifyne Juice Cleanse costs £345 and works well to hand-hold your way through what is, after all, quite a serious detox. For more advice, you can talk to the guys behind the cleanse on Twitter and Facebook. I must admit that I am intrigued by these cleanses but I just don’t think I could do it – I also couldn’t cough up that much money for 5 days of liquid. If it was cheaper, by about half, I might have been able to do it but not at that. I found your post the most useful of all the ones I’ve read/watched, but that’s because you’re the most honest (seeming anyway ha) blogger I know and I find that incredibly useful, so thank you. Wow, what a brilliant review… and outcome. You do look brighter, your skin looks clearer and I can see the redness has diminished on your nose. Who would have thought 5 days could make such a difference?! I wouldn’t be able to afford this plan unless it was for something major like a pre-wedding treat but it’s really given me something to think about this morning as I tuck into my carb-laden breakfast. I’d love to try something like this to see what it could do for me but the price…scary, even though i am a person who doens’t shy away from spending in general! Well done for sticking to it, you definitely do look “brighter” in your second picture. Might spend the rest of my lunch break googling alternative DIY juice cleanses (even if they won’t have the same effect!). Heya, I really love your blog and have been a reader (and occasional commenter) for quite a while now. Honestly, I find this post quite disappointing/ offputting. “Cleanses” are essentially crash diets — there is no science behind them. Drinking water and eating well for a couple days is just as good for you, without the risks inherent in crash diets. I understand that it’s your body and you are free to do what you want; but I think that this kind of post needs to also include the criticisms of juice cleanses in order to be helpful, rather than harmful. If you included both sides of the debate, plus your personal experience, that would make for a really interesting post. I really appreciate your input but all I can provide is my personal experience – both the good and the bad bits that I encountered – simply because I’m not qualified to put anything else forward as gospel (either for or against). I am sorry that you’re disappointed though. Totally open to hearing your thoughts on here, you sound like you know what you’re talking about and I always welcome healthy debate! My question is, do you physically feel £345 better overall? Or do you think you get the same results with a multivitamin, lots of water, a bag of prunes, & an drugstore facial mask? Hi Chelle, Well it’s all relative isn’t it? If £345 was an average payday splurge for me and I had somewhere/something that I wanted to look my best for – then yes, I’d do it again because it does (in my opinion) what it sets out to do. Having said that, I’d rather buy a 32″ telly for the bedroom and a box of Lindt chocolates with the change and scoff them ALL while watching reruns of Desperate Housewives. But as a reviewer, I have to be impartial when it comes to expensive services/products. If I think it doesn’t do what it says it does or it could do things better, then I say (and I have) – but I can’t dismiss something as crap simply because it’s expensive and the £300/£400 price mark seems about average for these “professionally provided/supported” cleanses. 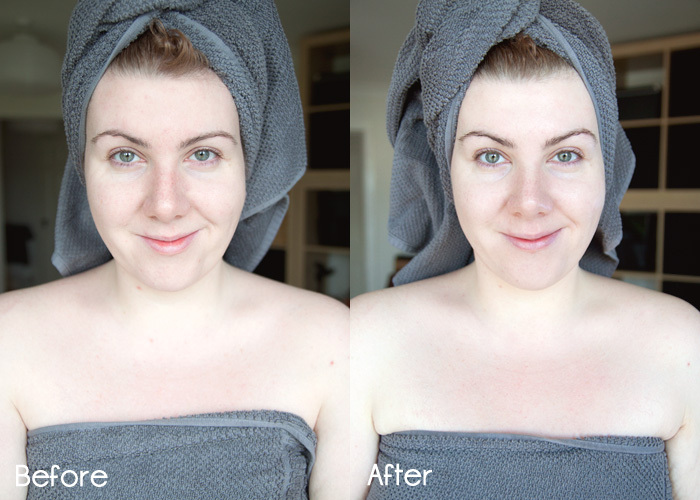 Wow, I am surprised at the difference here, your skin does look lovely and glowy! I do think £345 is an insane amount of money for some juice though, and I’m quite skeptical of the “science” behind detoxes, but damnit if your lovely clear skin hasn’t inspired me to start eating my five a day again! Making that everyday essential a little more fun! Today is World Porridge Day!